Gotham City. Four weeks ago. Using technology "left for him" by individuals unknown, the Mad Hatter builds a machine to tap into the Kraang dimensional portal tech, only to be apprehended by Batman before he can activate it. Three weeks ago. The Mad Hatter begins replicating the tech in his cell at Arkham. Two weeks ago. He begins placing the beacons on the inmates he wishes to use in his scheme. One week ago. Mind-controlling the guards, Mad Hatter escapes and begins sending the inmates through the portals. Manhattan. Now. Donatello explains to his brothers, April and the Bat-Family that the beacons were designed to immediately detach once each mind-controlled Arkham inmate went through the Kraang portal. The beacons were placed strategically around the city and, when activated, will create a signal that will cause mind-control effects on everyone in New York. 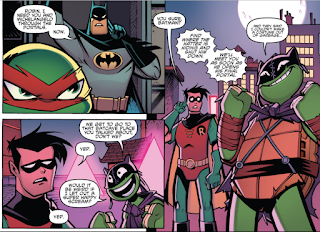 Batman calls Robin and Michelangelo (wearing a makeshift Batman costume) and tells them to go through the open Kraang portals they've been monitoring and track down the Mad Hatter. Gotham City. Robin and Michelangelo take out a pair of bank robbers who used to work for the Mad Hatter and learn that he's been hiding out in the abandoned Gotham Tea Room. Meanwhile, back in the sewer lair, Donatello triangulates the intersect points of the beacons and determines that the Hatter is targeting Times Square. Robin and Michelangelo invade the Tea Room and find the Hatter putting the finishing touches on an interdimensional antennae that will broadcast his mind-control signal. They confront him, but he unleashes an army of mind-controlled civilians dressed like Alice in Wonderland characters. 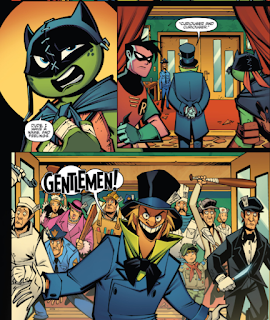 With the heroes stuck under a dogpile, Hatter activates his antennae and the signal takes over the minds of everyone in New York, including the Turtles and the Bat-Family (in Times Square). Hatter then announces that everyone will obey him as the ruler of "New Wonderland". Michelangelo manages to break free from the horde, runs out to the balcony and uses some bungie cords to slingshot himself back inside. Curling up like a cannonball, he smashes the antennae with his shell, freeing everyone in New York from the mind-control. The Mad Hatter pulls a gun on Mikey, but Batman arrives through a Kraang portal in time to punch the villain in the face. 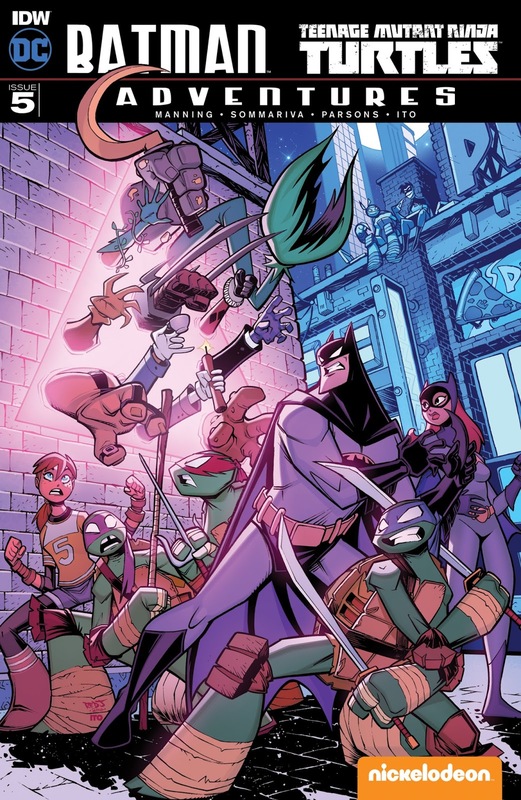 With the day saved, the Turtles say goodbye to the Bat-Family (Batgirl giving Donnie a kiss on the cheek, much to the Turtle's joy and April's derision) and return to New York via a Kraang portal. Batman tells Robin and Batgirl that although they've got the Joker, Harley and the Mad Hatter under wraps, the other Arkham inmates that were returned to Gotham are still on the loose. Robin says that before they get started on that mission, they should take a break. 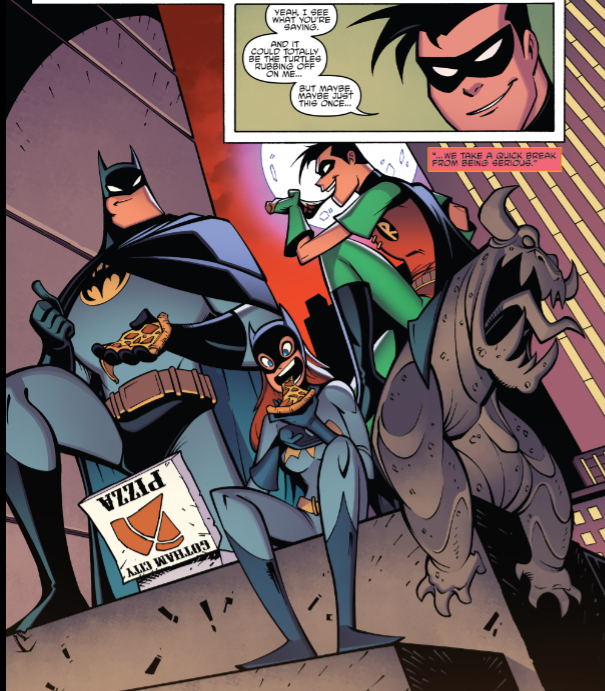 Taking a cue from their new friends, the Bat-Family goes out for pizza. Epilogue: In an abandoned farmhouse on the outskirts of Gotham, the Scarecrow is babbling that the true enemy will be coming for everyone very shortly. In order to survive the invasion, he'll need to be "scarier". In a notebook, the Scarecrow designs a far more disturbing new costume for himself. 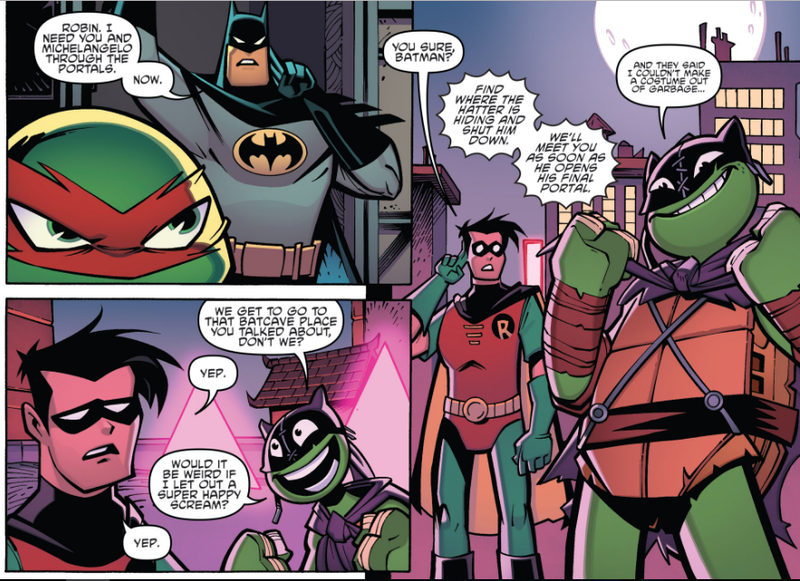 *This story is continued from Batman/TMNT Adventures #4. 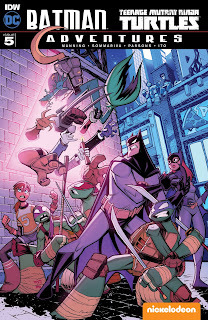 The story concludes in Batman/TMNT Adventures #6. *This issue was originally published with 4 variant covers: Regular Cover by Sommariva, Subscription Cover by Gabriel Rodriguez, Incentive Cover by Jeff Matsuda, and Wonder Con Exclusive Cover by Kevin Eastman. So wait, this isn't the last issue? It sure feels like a last issue. If it weren't for the epilogue, I'm pretty sure this would be the last issue. But it's not the last issue. And that's fine! This miniseries has been a lot of fun, so if they want to tack-on one more installment to stretch it out for an additional month, then I won't complain. I'm sure it'll be good times. I mentioned it last issue, but Mad Hatter turning out to be the Big Bad instead of the Joker was a brilliant bit of misdirection on Manning's part and helped give this mini some oomph in its last stretch (well, we've got one more issue left and the covers indicate who the REAL Big Bad is, but whatever). I like the Mad Hatter more than other Bat rogues, even if his gimmick is as shallow as the Scarecrow's. I think it's all because of Roddy McDowall's performance in the show; that man was a national treasure. And hey, you know, has anyone ever even tried to do a Roddy McDowall impression in a cartoon or something? Just asking, because I don't think I've ever heard anyone try to imitate his voice. The guy really was irreplaceable. This issue revolves around a Doomsday Device that gets defeated by smashing it, so maybe some of this plot isn't really all that brilliant. And heck, most of the chapters so far have just been "Turtles and Batman fight this supervillain. Next month, they'll fight a different supervillain". But it isn't the story that necessarily made this mini fun, but the interactions between the characters, the animated art from Sommariva, and some genuinely funny dialogue. Nickelodeon Michelangelo may get on my nerves sometimes, but Manning gave him a bunch of solid lines in this issue ("And they said I couldn't make a costume out of garbage..."). 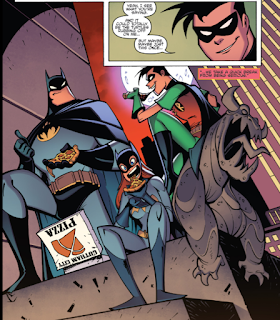 There's a cute two-page montage in the issue where Michelangelo and Robin remake the Batman the Animated Series title sequence, albeit screwing the whole thing up along the way. It's goofy, sure, but I think Sommariva did a good job with it (and gratuitous as the fanwank might be, it IS worked into the plot in an important way). Overall, I kinda feel like we're done and this should be a conclusive review, but there really is one more issue left, so I'll hold off the Final Thoughts for another month. I'll just say that now, every time I watch The New Batman Adventures, I'll remember that the Scarecrow was inspired to change costumes based on an encounter with the Ninja Turtles. That's the kind of canon I can get behind. "I'll just say that now, every time I watch The New Batman Adventures, I'll remember that the Scarecrow was inspired to change costumes based on an encounter with the Ninja Turtles. That's the kind of canon I can get behind." For real, that moment stunned me as a reader. The fact that a cartoon from 1992 is having a crossover from a cartoon from 2012 should be enough of a shocker in itself. Feels trippy that B:TAS universe can crossover with a Turtle universe that wouldn't even exist until over 20 years later.